Critiquing has changed my attitudes and transformed the quality of work in my classroom. Of course, there are other factors that have helped with this (for example, project based learning, SOLO taxonomy and Big Questions), but critiquing deserves the spotlight as a strategy that can have a profound impact on learning. It is high risk and takes time to master, but I have been so impressed with the results. Asking students to put their work up for public scrutiny is a bold move, asking them to listen patiently as others coolly dissect their work is difficult for some. It is difficult for teachers too, relying on a whole class to come to with quality comments with just a few prompts from you. However, it does work if approached in the right manner. You need to get across the message early on that a piece of work is not an end in itself, but a stage in a longer process. Quality takes time and students need to get away from a checklist driven mentality and move to one of continual improvement. This will probably be a struggle at first, as students used to the former. Also, you have to ween them off their grade/level dependency (it only makes their checklist addiction stronger). I agree with Berger when he tells students there are only two grades in his class: ‘A’ and not done. The purpose of these quotes (straight from Berger) was to establish, in terms relevant to them, why drafting is needed. I then moved into the more abstract and asked students to consider an article from the Big Issue about what made Usain Bolt great (Issue #966). From this they pulled out their favourite quotes (see image above) and we made a display. I did this same activity with all groups from Year 7 to Year 13 so that the message was absolutely clear. (Click on the rules for Darren Mead’s excellent dissection of how they work). These have been crucial in making critique work. By making the whole AfL experience public, it is easier to spot weaker comments and ask students to clarify or provide specific examples. Also, the idea that everyone should be involved has been crucial. In most instances, the process has been contagious and students have responded well. The last rule sums up everything else and gets to the heart of why the process is so powerful. Practice has shown me though that rules need to be established before every critique. Year 9 will soon be doing their fourth of the year and I will go over the rules carefully; it reinforces the expectations and shows them that it is a serious business. The first few times that I used critique I treated it too lightly. I wanted to establish the concept of it with students and so allowed them to get away with comments that were not that in depth. This was completely wrong. Critique works best when it works towards quality. It has to be the goal of every session, even if it seems hard or harsh. You might need several sessions of critique to get the desired product, but it should always be there as your aim. This is why I gave Year 13 an article aimed at Cambridge students, written by a leading academic, as an example of what I was looking for. That is the level I want them to reach and their critique of each others work was centred around making this a reality. There are two obvious differences between the two drafts. The first is length; the second attempt is almost two minutes longer and therefore includes much more detail. However, the most impressive thing is the amount of students who joined in the second time around. Many more wanted to add some details or an explanation and it became (almost) a whole class piece. Next lesson we will go back to this and critique again to make further improvements. Audioboo and critique of exhibition pieces have stopped critique from becoming stale and allowed my groups to grasp its true purpose: helping them to achieve quality. At first, I tried to critique a whole class at the same time. It was hard to keep the pace going and also it was too long. This approach worked fine for sixth form where numbers were smaller and patience longer; in fact, when Year 13 critiqued their opening paragraph to an essay it was incredibly beneficial as we could identify several key features of a good answer and share excellent examples of knowledge to back up points. Looking back though, the reason it was so successful is that everyone had a paragraph that they were ready to share. Critiques where lots of students need to share work often fail because of variation in the amount of work they have achieved. Therefore, I have been working hard to find ways to minimise this. Lower down the school I have tried several things to ensure that critiquing is more fluid and focused. With Year 9 I trialled critiquing someone’s work at the end of each lesson. This has created a really healthy attitude among the group, although we quickly extended it to cover two people (less scary and more opportunity to develop key principles of what we are studying). With Year 8 I have critiqued segments of a whole: We ask different people to present one part of the work and then stitch the bits together to make a whole. Then, we can critique the whole product. This gives us a range of opinions and answers, but also allows us to focus on the principles of an effective piece (the Audioboo recordings above are a good example of this). Sometimes you need to see all the work. Post-its are great for allowing everyone to contribute, but it still needs for you to bring back the discussion to a central place and establish the key features. After a Post-it activity, questions like ‘What features did you see a lot?’ and ‘What advice were you writing often?’ are good to get the discussion going. If you need further proof, I used critique in a lesson observed by an HMI. I said six words in the 30 minutes they were there: “Get yourself ready for a gallery critique.” They were very impressed. You work as a resource creator in a school. This means that you create exciting new PowerPoint presentations every week that include challenging tasks, inspiring images for discussion and so on. You are very proud of your slides. At the end of the week you hand over your beautifully crafted presentations to your Line Manager who deletes them without even looking. This happens weekly but you get paid a handsome salary. How do you feel about this? You are a student in a school. This means that you will create, produce and complete a series of tasks and activities. At the end of the week you have handed in more than five pieces of work. You feel very proud each time a piece of work is handed in to your teacher. Next lesson your work is returned to you. It does not contain any comments or feedback about your masterpiece. This happens in most lessons and you are forced to do this weekly. How do you feel about this? Providing feedback is an essential ingredient to ensure that students’ motivation is maintained otherwise there’s little point in working hard and trying to achieve. Their intrinsic motivation is heightened each time they receive critical and positive comments in their work, more so than if we try to convince them that it’s important they work hard otherwise they won’t get a good job. It is the immediacy that is the crucial factor in them progressing and becoming more motivated. 3. Select milestone tasks e.g. an end of unit task that you mark and provide detailed feedback using the power of Assessment for Learning (we wrote a lot about effective assessment ideas in our last book). If you haven’t decided on these milestones as a department then we encourage you to do so first. 4. Hand back work as quickly as possible so that students link the homework/assessment with your feedback. 5. Allow students time re-draft work or parts of work based on the feedback you provided them – this is a concrete way to make them see their own progression. In the brilliant book The Upside of Irrationality , Dan Ariely and his team investigate the relationship between motivation and a person’s meaning to their work. In this experiment they created a sheet of paper with a random sequence of letters on them and asked particpants to find instances where a letter ‘S’ was followed by another letter ‘S’. They were told that each sheet contained 10 instances of consecutive ‘S:s’. Participants were to find all ten instances of the S:s to complete a sheet. They would be paid: 55 cents for sheet 1 , 50 cent for sheet 2 and so forth until they got to the 12th page where they would receive nothing. In this control group participants were asked to write their names on each sheet prior to starting the task. When a sheet had been completed it was handed over to the researcher who would examine it carefully, nod and show their appreciation of the participants work before adding it on top of a pile of paper. This group would complete the same task as the previous group but were not asked to write their name on top of each sheet. When they handed over a completed sheet the researcher took it without saying thank you and without looking at the sheet before adding it to a stack of paper. Unlike the the other two conditions, this group would hand over their sheets but instead of placing it on top of a pile of paper, the researcher placed it in a shredder without even glancing at it. The results were rather interesting. As you can imagine, the ‘Acknowledged’ condition completed more sheets of paper than the ‘Shredded’ condition after payment had ceased. In fact, 49% of participants from the former condition completed 10 or more sheets compared to 17% from the ‘Shredded’ condition. Interestingly, the average number of sheets produced by the ‘Shredded’ condition was virtually identical to that of the ‘Ignored’ condition where 18% managed to produce 10 sheets or more after payment had ceased. So there was no major difference between the group whose work was destroyed and the group that was ignored. In a school context this is a no-brainer: if you want to lower motivation amongst students then either bin their work or don’t bother to look at it. On the other hand, if you wish to motivate them, give them praise and acknowledge when they have produced something good. But if you think about it, it’s more complex than that. If you provide students with thoughtful praise and feedback rather than simply giving them a grade, they are more likely to work harder because of the effect of meaning on their work. It becomes clear to them that their effort was worth it. As teachers many of us crave recognition for our work either from colleagues, Senior Leaders or from our students. This is the reason why being a teacher is a bit like a roller-coaster ride, there are constant ups and downs depending on the amount of praise we receive. Being a student is more difficult, going from lesson to lesson up to five hours a day, working, listening and contributing in different ways. Acknowledging what they have to say and what they produce will ensure they don’t feel like we’re shredding their work. If you open a jar of pre-made of pesto and add that to pasta, how far would you feel pride over your creation? Not much we could assume. How about if you blend together some fresh basil leaves, olive oil, garlic, pine nuts, a dash of chili-powder and then add that over a bowl of fresh pasta? The feeling is probably rather different. You might even insist on finding out what other people around the dinner table think of your culinary skills? The difference between the two scenarios is simple: you were not involved in the former whereas you were in the latter. On a similar note, if you’ve ever constructed furniture from IKEA perhaps you would agree that you felt rather chuffed with yourself both after completing the piece of furniture and a long time afterwards (maybe each time you look at it?). This is the ‘IKEA effect’, if you get something for free you may not enjoy it as much as if you had been involved in its creation. So in this respect, effort creates long-term satisfaction and motivation. The question is of course, how much effort do students have to consume before they take pride in their work if the IKEA effect is to be true? The outcome of this project was interesting. Although this class by nature was hard-working and dedicated students in general, something changed during the span of this extended task. As part of the activity they had to construct their memorial by first producing a draft which their teachers reviewed, complete the memorial, write a script as well as prepare some form of presentation. Those segments of the task were straight forward and students were used to working in that way. The change came when they were informed that there would be an exhibition where they would present their work to passing visitors and that these ‘visitors’ would grade their work based on agreed historical criteria of ‘significance’. 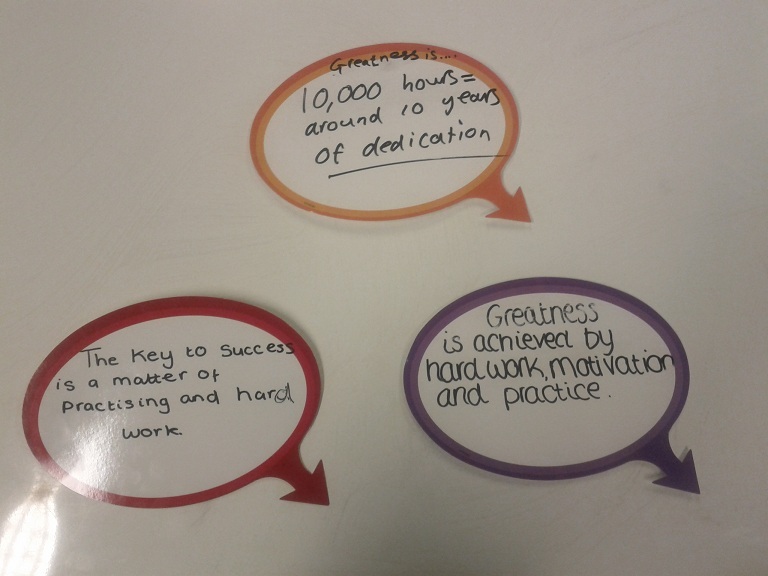 The impact on meaning of their work and therefore on motivation showed a marked difference from that moment on. They had, in many respects, built a piece of work from scratch and after much research on the subject. Now, faced with yet another challenge they were to meet their peers who would evaluate this construction. The pressure was on. From a teacher’s perspective learning happened on different levels. In terms of skills students moved up Bloom’s Taxonomy and tackled the difficult skills of both evaluation and synthesis when they used their understanding of the whole of year 9 history, planned and constructed their ‘memorials’ as well as critiqued others’ work. Students really worked hard at trying to convince each other that their memorial was the most accomplished one. But perhaps most importantly, students wanted to do well and they were motivated by the opportunity to show off their work to classmates. Although the challenge of public speaking could have added negative stimulus in terms of social pressure but because they talked to individual ‘or pairs of visitors’ this never occurred. When the class took an end of year survey several weeks later about their views on the subject as a whole the vast majority commented that the memorial task and others similar to it were the highlight of the year. 3. Why not get students involved in teaching mini lessons? We wrote about getting students involved in teaching lessons in one of our books. Using the power of Student Voice and consider how you can plan lessons with more active involvement from your class are important components in increasing motivation amongst students. We don’t have to go to the extent of shredding students’ work to demotivate them and decrease learning, ignoring to use purposeful praise and meaningful feedback will have the same effect.